Tech. Sgt. 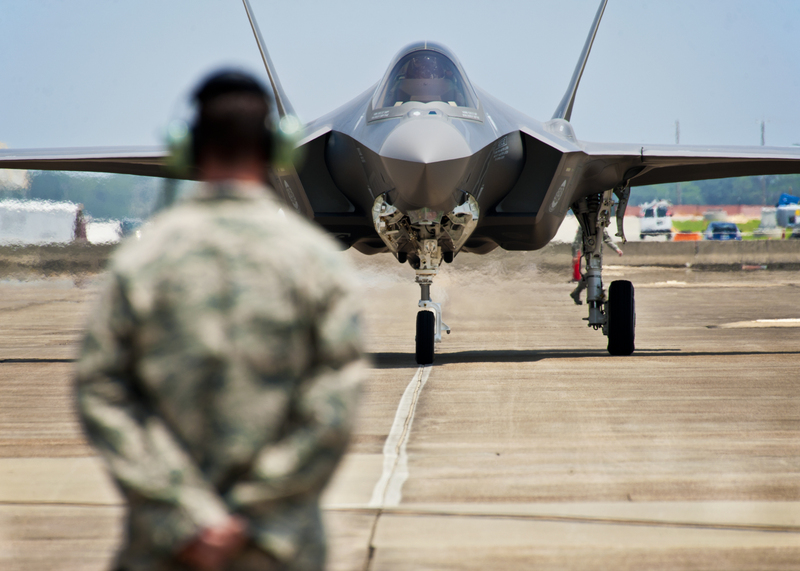 Brian West watches an F-35 Lightning II U.S. approach for the first time July 14, 2011, at Eglin Air Force Base, Fla. // Samuel King Jr.
It’s been a good 97-year run but it’s time to dismantle the the fighter fleet and start pumping money into Predators and Global Hawks. This according to Michael O’Hanlon, a Senior Fellow at the Brookings Institution. It’s game over. In an fascinating article previewing the inevitable downturn in the defense industry as the government cuts spending, AP’s Jonathan Fahey writes an obituary for the gangbusters military spending spree we’ve been on since 9/11. In it, O’Hanlon says the industry is just waiting for the hammer to drop on Joint Strike Fighter and all future manned aircraft. During wartime, when dollars are flowing, the new equipment developed to battle new enemies is used together with the equipment that had been developed for earlier wars. But as budgets shrink this time, some of the technologies that were developed during the past decade, such as the unmanned aircraft, will have to replace older systems entirely. I suppose we’ll have to wait and see but it’s not completely far fetched. This horrifying future has already been envisioned in the 2005 blockbuster cinematic achievement “Stealth”, a cautionary tale of what happens when computers have too much power. Take note, Congress. But O’Hanlon’s argument has a bigger problem than the apocalyptic scenario laid out in Stealth. If fighters and bombers go away, so do fighter and bomber bases. Imagine getting that through congress. “Sorry Sen. Begich, and sorry Sen. Murkowski, but we’re closing Elmendorf.” Not likely.